Anyone, who thinks that because the Maturity Institute is people focused it is aimed at HR people, should look at the ground-breaking work we have been doing over the past three years. MI is a composite of a range of management disciplines and the capabilities we have developed embrace serious leadership issues requiring significant professional development. 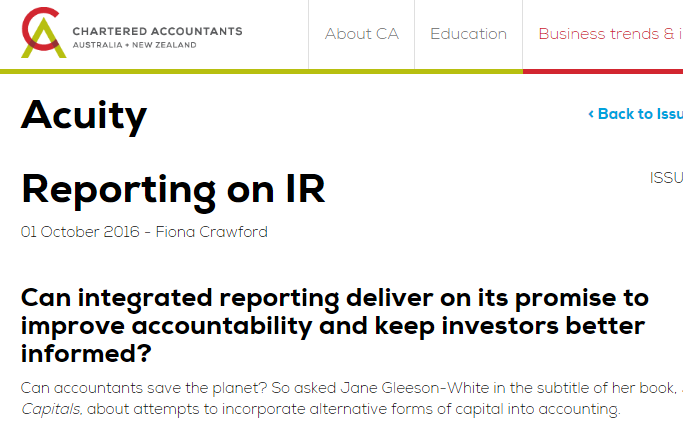 For example, many Chartered Accountants seem to think Integrated Reporting is their sole domain – it isn’t and it cannot afford to be. See the video below for the world’s first Integrated Report, on AT&T, that specifically integrates human governance and human capital value with financial reporting. In the article above, from the Chartered Accountants of Australia and New Zealand, John Dumay, Assistant Professor at Macquarie University, is quoted as saying – “Imagine if an investor waited for the latest integrated report before making a decision to buy or sell shares. Opportunity lost”. That might be true but with MI’s organizational maturity rating (OMR) investors now no longer have to wait – they can get ahead by looking at the organization’s OMINDEX rating which is forward focused and predictive. They could even commission their own integrated Human Governance Report. Traditional accounting produces its reports after the fact – maturity reporting is specifically designed to be ahead of it. This entry was posted in Maturity Tales and tagged AT&T, chartered accountants, CIMA, CIPD, Integrated Reporting, John Dumay, Macquarie university, SHRM. Bookmark the permalink.